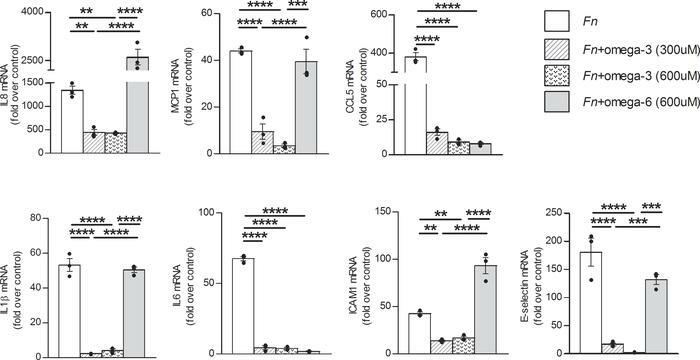 Purified omega-3 fatty acids suppress endothelial inflammation induced by F. nucleatum. Purified omega-3 (300 μM or 600 μM) or omega-6 fatty acids (600 μM) were complexed with fatty acid–free BSA at a molar ratio of 4:1 and preincubated with HUVECs for 3 hours prior to bacterial infection. Log-phase F. nucleatum was incubated with primary HUVECs at an MOI of 50:1 for 24 hours. Levels of mRNA were measured by real-time quantitative PCR and are expressed as fold change compared to the uninfected control group. Each experiment was performed in triplicates and repeated at least 3 times. The results are presented as dot plots with average and SEM. One-way ANOVA was performed with Bonferroni post-test. **P < 0.01, ***P < 0.001, ****P < 0.0001.